Minerals are the scaffolding of your being. Think of it like the framework of a well-constructed house. If the walls, roof and basement are sound, you will be able to live a safe, happy healthy life inside your home. It’s the same for a babe wanting to take up residence inside you. Your superstructure is literally held together by minerals. Fertility depends on healthy levels of magnesium. Address any deficiency before conception. It is also crucial for maintaining a healthy pregnancy. Plummeting blood sugar is a symptom of low magnesium. It causes the nausea and vomiting of the dreaded morning sickness. Calcium is a vital ingredient in triggering the growth process in embryos. The more calcium in the surrounding fluid, the better. The healthy female reproductive tract needs to be rich in minerals, especially calcium. One reason an alkaline environment is so essential to fertility is in what it does to the sperm. When it’s time to penetrate the egg, the sperm makes an abrupt shift from its slow, steady swim pattern. Its tail now uses a whip-cracking snap to thrust itself into the egg! Absorbing calcium is one of the main minerals that allows this change. Natural fertility and conception are dependent on calcium and magnesium. The foundation for a natural fertility plan is a mineral-rich, alkaline system. You need this if your goal is to have a birth announcement in nine months time. 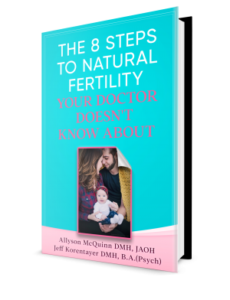 This topic is further explored in Chapter 7 of The 8 Steps to Natural Fertility Your Doctor Doesn’t Know About. « What Is Sequential Therapy?